Because ForteBio’s BLItz system would not be sold through a traditional sales force, it needed a dedicated website. Structure, interactivity and information on the site helped make the BLItz online experience similar to the live conversation a sales rep would have with a customer. 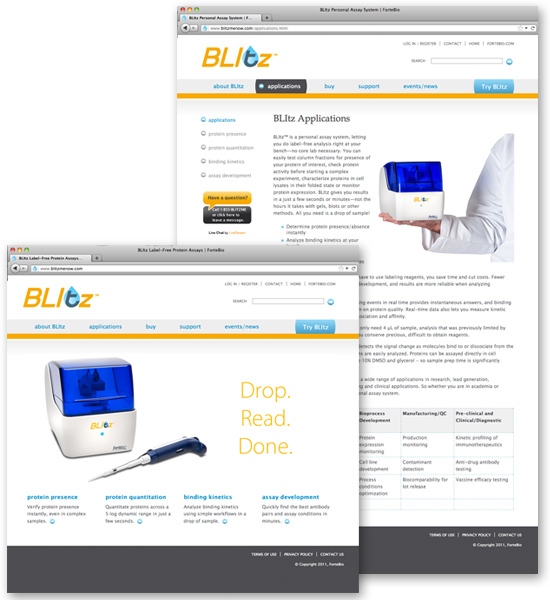 The site’s one-stop shopping design and functionality let visitors get specific information on applications and operation, download literature, order online, request quotes and schedule a demo system to be shipped to their lab. If any questions came up, they could click the integrated live chat option and immediately connect with a BLItz specialist.